WHAT: While I try to keep up with all of the greatest weirdo toys that dollar and discount stores have to offer, once in a while some treasures slip past me. 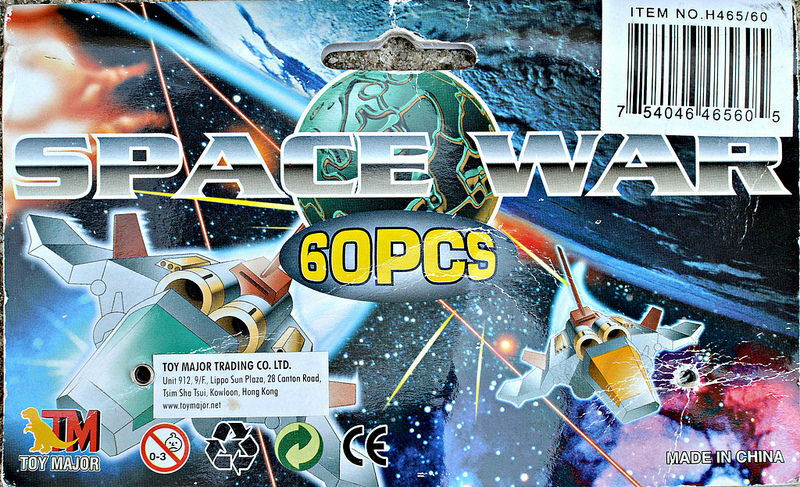 One example is Space War, a mini figure set I had never seen at all until my buddy Justin kindly sent me some after coming across a couple bags. These things are real Little Weirdos-approved gems. 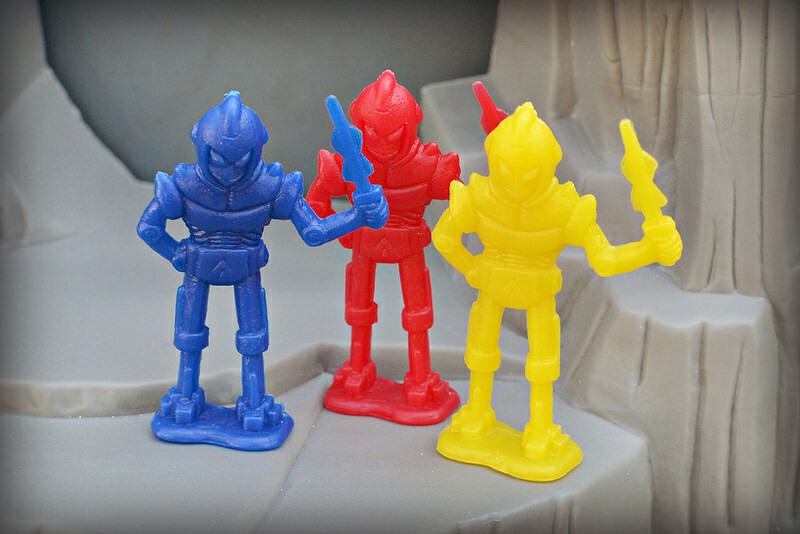 They're 2 inch tall hard plastic "army men"-type figures of space creatures, along the lines of classic Galaxy Laser Team figures but without any of the human/astronaut characters thrown into the mix. They came in a clear plastic bag with a header card featuring some typical, Star Wars-eque space battle graphics. 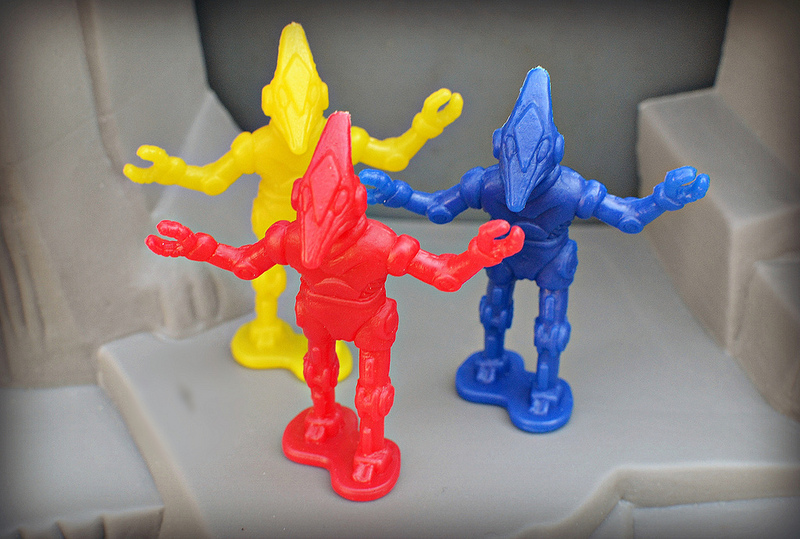 There were 60 pieces in a bag and six different sculpts, with each sculpt coming in blue, yellow and red. The plastic used is slightly translucent, which I think makes them look cooler. This guy is one of the weirdest-looking of the bunch. 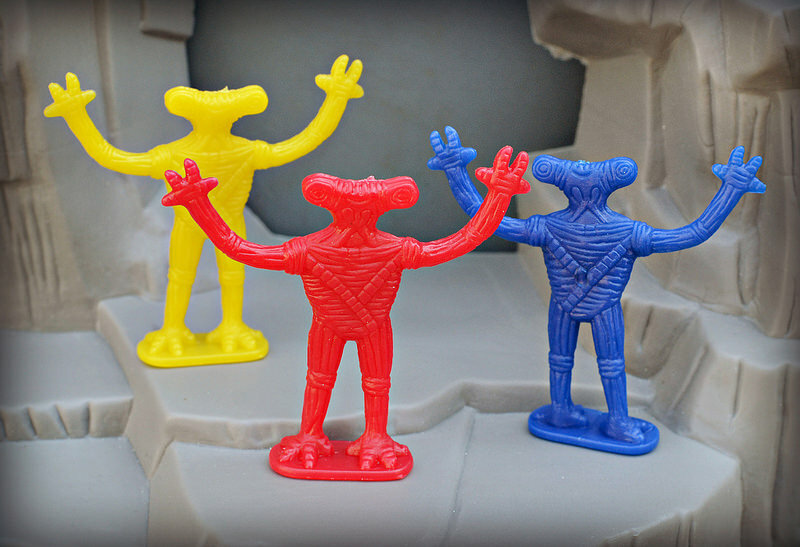 His design seems to have been copied from the "Amphiboid Scientist" in the mid-1990s line of alien bendable figures, UFO Files. Take a look and see what I mean. I like how this robot's sort of bird-like. His sculpt style reminds me a bit of the old Ro-Gun Robots line from Arco. One of my favorites out of the six characters. This dude is another one of my favorites from the set. I feel like his design might also be copied from somewhere else, but I can't put my finger on it. This one's sort of like amphibian-man meets Flatwoods Monster. Finally, here's another one that was "inspired" by the UFO Files bendable line. This cyclops alien looks an awful lot like the Muskel Eliminator from UFO Files. WHEN: The specific figures I have were found recently, but I would guess that these first became available many years ago. The company responsible for them, Toy Major, shows them on their website, which looks really old and says "Toy Product Catalog 2001" when it shows in Google search results. WHERE: The figures I have were found in a discount store in Australia, but I'm guessing they could at some point be found in the U.S. and probably other countries as well. WHO: Toy Major Trading Co., Ltd., which--from looking at their website--produced a bunch of other cheap fantasy and animal-themed toys. These are really cool looking and i like the fact you get all Aliens/Monsters and no human characters....I would buy these if i ran across them with out blinking a eye. 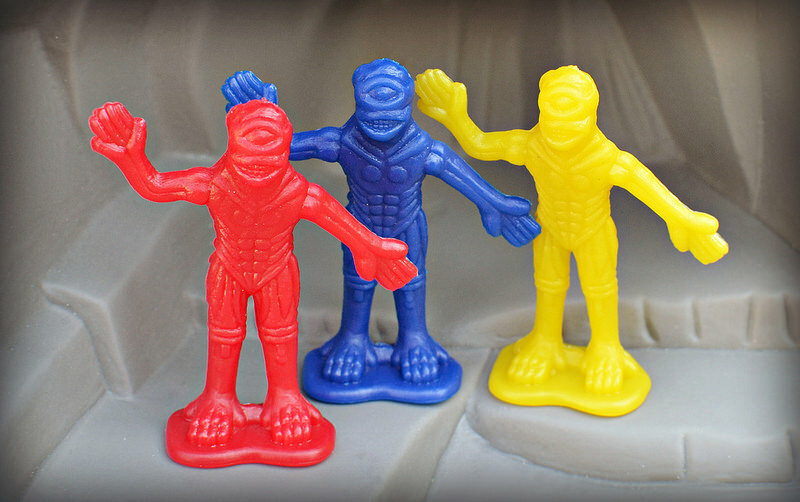 Yeah, I think there was a separate bag of these that contained just human astronaut types figures, which are so much less fun. Those are really cool. I have a couple of those bendy cyclops figures. It's always interesting to see toy designs turn up again in random places years later. Especially when it's something obscure going to something even more obscure, like with the UFO Files and these. Were these found at a store called The Reject Shop? That's an Australian one where lots of this stuff turns up. Recently I was in there and saw a bag that was half full of regular army men, with the other half full of David Icke-style reptilians. Bizarre! I think he did say The Reject Shop. Those army men vs. reptilians sound interesting! I think I have some of them at my house -- if so, I will email across some pictures. I have had a look at my local Reject Shops, but haven't found any like these, I have to say. Might be a state-based or regional thing. I really want these for some odd reason..So I went to my local doller store and didnt see them, but oddly enough I saw the "Elite Forces" army men type bags from Toymajor's toys..didnt really like them..but now I'm thinking I might just get a bag for fun. Yeah, I don't recall ever seeing these in the States, unfortunately. If my buddy from Australia didn't tell me about them, I wouldn't have even known they existed. I would really like to get a couple of bags of these. Anyone found them here in the States? I think they might have been in the States years ago, but probably not anymore. For some reason they were recently at a store called The Reject Shop in Australia, though. I have also tried the dollar stores. I never go in those; so much junk! Anyway like you, no luck. I tried emailing the Toy Major company but I don't think they read English. I got the original ones when they were distributed in the states, about ten years ago. 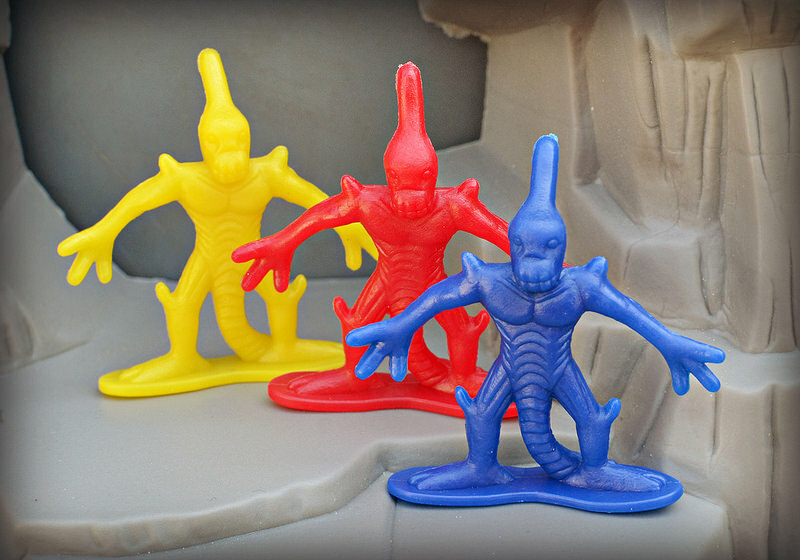 They came with space men molded in gray and all of the aliens were molded in a glow-in-the-dark green. I would like to get my hands on a couple of bags of the re-releases; the colors look cool. 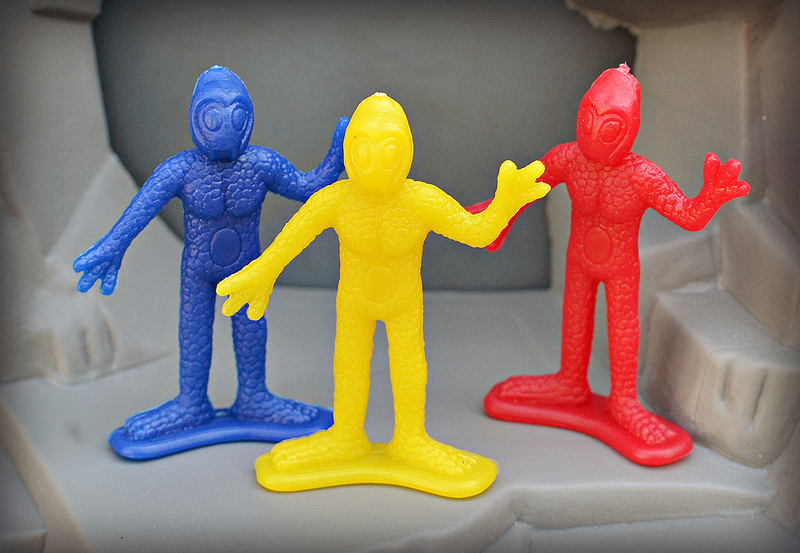 The set with grey space men was released by Accoutrements. 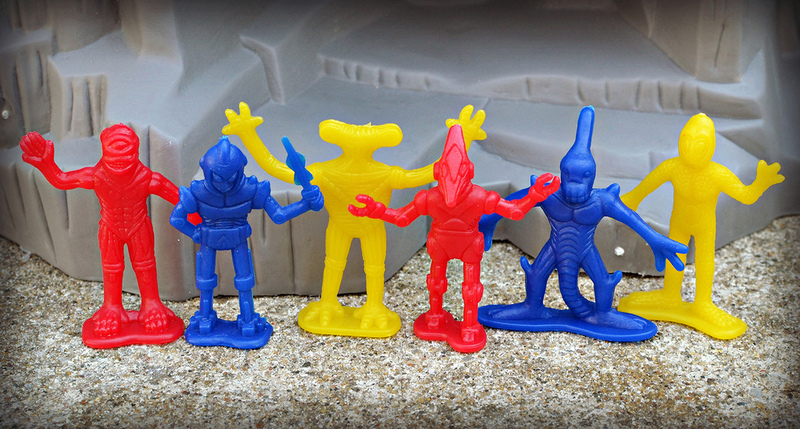 Google Accoutrements Spacemen Vs Aliens & you'll find some limited info & pics of these guys. I've taught my grand-nephews that army men, aliens, and dinoaurs are much better than video games. I love video games, but I have to agree, they are!